Greetings again from the darkness. If you know an adolescent who is ready to step up from comic book movies, this would be a terrific introduction to more emotionally dramatic and narrative-driven cinema. That’s certainly not meant to imply that director Todd Haynes’ latest is only for kids, or even that it’s aimed at that demographic. Instead, it’s the rare opportunity to follow two intersecting story lines over two different time periods with kids as the main focus, and have some very interesting post-movie discussions related to characters, eras, and filmmaking techniques. We follow the stories of two kids who are separated by 50 years. Although the time boundary exists, the similarities between their journeys are many. Each is running away from home in search of their roots and identity. They are both hearing-impaired and living in less than ideal family environments. Additionally, their footsteps cross many of the same places in New York City as two museums play key roles. Ben (Oakes Fegley, PETE’S DRAGON) is a 12 year old living in Gunflint, Minnesota. It’s 1977 when his mother (Michelle Williams) dies unexpectedly and a freak accident takes his hearing. Convinced an odd bookmark is a clue to finding the father he’s never met, Ben sets off for New York City. Rose (remarkable first time actress Millicent Simmonds) lives in 1927 Hoboken, New Jersey and is obsessed with silent screen star Lillian Mayhew (Julianne Moore in a dual role). Rose is an artistic child whose domineering dad has little time for her, so she hops aboard the ferry and heads to the big city to track down an idol – who may be more closely tied than we first imagine. 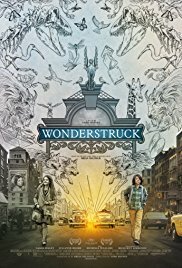 Brian Selznick adapted the screenplay from his own novel (he also wrote “The Invention of Hugo Cabret”, which was the basis for Scorcese’s HUGO), and some may find the two story lines muddled or difficult to follow. However, for those who connect with the characters and their adventures, it’s a fascinating and entertaining ride. Director Todd Haynes (FAR FROM HEAVEN, CAROL) has established his expertise in visual stylings, and here he gets to present two distinct looks for the separate eras. Ben’s 1977 world is filled with the polyester and neon colors of that era and it’s even given the washed-out look of 1970’s cinema. On the opposite end of the spectrum, Rose’s 1927 world is presented in black and white as a silent movie. The lack of dialogue allows us to focus on her facial expressions and body language, which tell us what we need to know. The American Museum of Natural History plays a significant role in both stories, and the Queens Museum is central to the finale which ties up the two pieces for us. The contrasts of the two eras are as vital as the similarities. Along the way, each of the kids gets a bit of help. Ben befriends Jamie (Jaden Michael) whose connection to the museum and the city provides Ben a boost, while Rose’s much older brother Walter (Cory Michael Smith) also has a connection to the museum and helps put Rose on the right track. The distinct photographic styles help us easily switch between eras, and much credit goes to cinematographer (and frequent Haynes collaborator) Edward Lachman and editor Affonso Goncalves. Oscar Wilde’s quote, “We are all in the gutter but some of us are looking at the stars”, takes its shot as the theme for the two stories, and really it’s a heartfelt film with interesting storytelling and unusual cinematic effects. The set design is terrific throughout, and especially vital during the silent movie segments of Rose’s story. Carter Burwell’s prominent score also effectively shifts styles between stories and eras. The ties that bind us – a core need to understand our roots – do so regardless of age and time period. This is a nifty little film that provides much to discuss and consider. This entry was posted on Thursday, October 26th, 2017 at 8:10 pm and is filed under Drama. You can follow any responses to this entry through the RSS 2.0 feed. You can leave a response, or trackback from your own site.